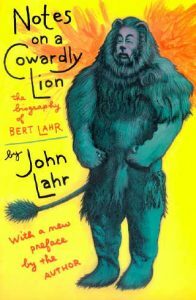 With a New Preface by the Author First published in 1969, Notes on a Cowardly Lion has established itself as one of the best-ever show business biographies. Drawing on his father’s recollections and on the memories of those who worked with him, John Lahr brilliantly examines the history of modern American show business through the long and glorious career of his father — the raucous low-comic star of burlesque, vaudeville, the Broadway revue and musical, Hollywood movies, and the legitimate stage. Here in rich detail is Lahr evolving from low — dialect comic to Ziegfeld Follies sophisticate, hamming it up with the Scarecrow and Tin Woodsman on the set of The Wizard of Oz, and debuting Samuel Beckett’s Waiting for Godot in America, which Kenneth Tynan called — one of the most noble performances I have ever seen. —  In the examination of Bert Lahr — s chronic insecurity and self-absorption, the breakdown of his first marriage, and the affectionate arm’s length he kept between himself and his adoring second family, John Lahr’s book also brings the reader closer than any other theater biography to the private torment of a great funny man. This edition of the book includes the award-winning essay — The Lion and Me, —  John Lahr’s intimate reflections on family life with his distant, brooding, but lovable father. A first-class stylist, John Lahr takes the reader beyond the magic of show business to a dazzling examination of how a performing self is constructed and staged before the paying customers. Both as theater history and biography, Lahr’s book is superb.